Playing around with the Hollow Moon Video Show, it came to me that the transition from outer space into the moon, vice versa, needs transitional effects. I also noted that it is hard to stop at a exactly the position one desires around the video screen. This calls for a throttle! It seems nice that in approaching the moon the hull seems to open up and show the interior world – as an invitation to come and explore. Next question is how to implement such a feature. The choice for a shader effect seems preferable over a vertex based effect here. 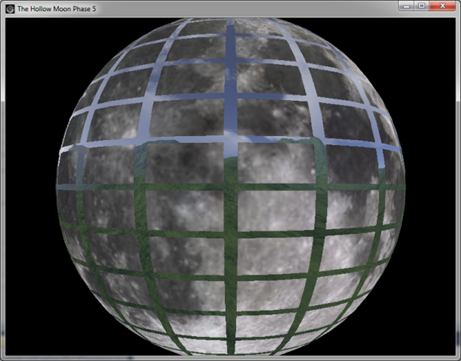 A vertex based effect means that an animation will move parts of the sphere (the moon) around to open up. But, the same vertices are used to project the inner world, which would then be invisible where the moon surface was has been removed. So, a shader effect it will be. 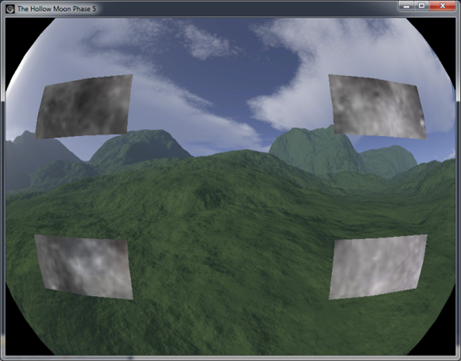 In order to complicate matters not too much, the expansion shader used earlier was reused. The effect however presents itself entirely different in this new settings; expansion is now an inverse function of the distance to the surface, and it works on a sphere, not a flat surface. This provides for a quite nice effect. You can’t immediately see the video screen now, I’ve increased the size of the moon significantly in order to improve the illusion one is travelling through an enormous and desolate landscape. See the section on throttling for more. The shader effect above was relatively simple to implement. However, now the challenge is to create a shader effect within an environment mapping effect where shader sampling is in 3D space. Behold, it is not the math, it is the shader engine (level 2) that responds to any creative idea with the message that the shader is too complex to process. A disappointment. So, for now I’ve settled for a simple black spot (hole in the moon, if you like) that shows the stars in the background (to be implemented J ). 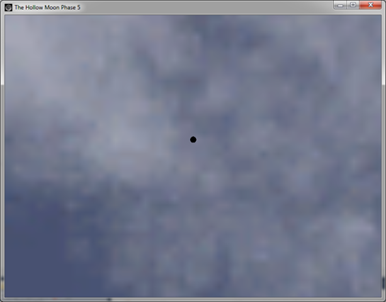 The idea is simple: a small black spot is projected onto the moon interior surface where we will leave the moon. We approach, and the spot grows bigger, then we pass through. We create the hole by just clipping the shader texels at the desired location. But how does one find the right position for the black hole? The answer to that question was not easy, and it is not quite satisfactory in its final form. The Silverlight XNA library contains an Intersect method for both the BoundingSphere and the Ray classes. The idea is simple: if you have a position and a direction – and a chase camera usually has, you can define a ray, and the Intersect method provides you with the distance to impact, if any. However, this method does not work for rays that originate within the BoundingSphere. OK, no problem, I’ll just project myself out of the Bounding sphere by a known distance, turn around, and then obtain the distance to impact. This gives you a value, BUT, the Intersection method provides you with a distance to the center of the BoundingSphere, not to its hull, and not in the provided direction. So. As an alternative I found a handy article at StackOverflow containing a decent treatment of how to mathematically solve the intersections of a sphere and a line (ray). A static method implementing the theory takes 0.01 second to computer the distance to either zero, one or two intersection points. This solution works fine most of the times, but if you navigate through e.g. the top of the moon, the black spot gets distorted into an asymmetrical form that resembles an ellipse, and it gets displaced. It seems to me that the distortion indicates the limits of the rendering system, rather than an error in the algorithm that positions the black spot. The image below depicts the black hole in effective mode. OK, I do feel an obligation to improve on this. But it will have to do for now. As soon as I thought out an dramatic effect that the shader engine can render, I will implement it. I promise! The idea of environment mapping is that the camera is always unboundedly far from the camera, so that a parallax effect is created: the background doesn’t move with the camera (or observer). One technique to implement this is to move the background with the camera (same translation), or alternatively to stitch the background to the far plane. Although this is theoretically convincing, and sometime right in practice, I find it unsatisfactory. The background seems dead, not just far away. I’ve been in open ground a lot, and when you travel around, you will notice that your view of the landscape changes, especially if you watch the seem scenery for a prolonged time. It changes slowly, though. In the current situation, that of the Hollow Moon, there is also little else for visual orientation than movement of the landscape. So we need, to move the landscape a little in order to generate the illusion of travelling through is. If not, encountering the video screen, or the boundaries of the moon itself, come a complete surprise. Now, if we would move slowly relatively to the moon, and also give the impression that the moon is huge, it would take forever (well, weeks) to get from the starting point to the center of the moon. So, we need a throttle. The throttle can be used to move towards and into the moon quickly, and to travel inside the moon increasingly slowly. A throttle has been implemented and is controlled by the S (slower) and F (faster) keys. I’ve also double the maximum speed and increased the size of the moon relatively to the video screen. It is now about 1250 times the size of the screen. How to operate the throttle is also indicated on the start screen message. A demo application of phase 5 of this project can be found here, scroll down to “Moon boundary transition effects” (no, the # tags still don’t work). It turns out that the further the development of this moon thing progresses, the more wishes arise that are not (yet) implemented. That in itself is curious, but well. This section is to be a recurring section of those wishes, if only as a reminder of imperfection, and a source for philosophical contemplations. So far we have the following wishes. As discussed above, but feasible for the shader compiler level 2, while in the context of environment maps. As noted, it is not easy to implement 3D effects on the sound sources, split by stereo channel. WE cannot apply panning to the individual sound channels of a video. If we could, the user would experience the oral effect of the sound pillars rotating around. Also a Doppler effect would be nice. The sound pillars that flank the video screen are evenly colored (gold). They could do with some grid like textures that indicate the presence of speakers at those positions. We wouldn’t go as far as to implement moving speakers (woofers), would we? If the camera approaches the moon surface or the interior surface, the low resolution of the images used begins to show. So, we would like to be able to use higher resolution. We also should implement mipmap levels (when you get closer to the surface, a higher resolution image is presented), I know. Mipmapping has the drawback that is greatly increases the amount of data that has to be sent over the internet. There has to be stuck a balance here.